In my opinion, as more males present themselves as females in public, it encourages other males who are on the cusp to present as females, too. It is a snowball effect. My father bought the New York Daily News every day and I noticed that at the end of the week, probably in the Thursday or Friday edition of the News, there would be a thumbnail-sized ad in the back pages of the paper that caught my eye. 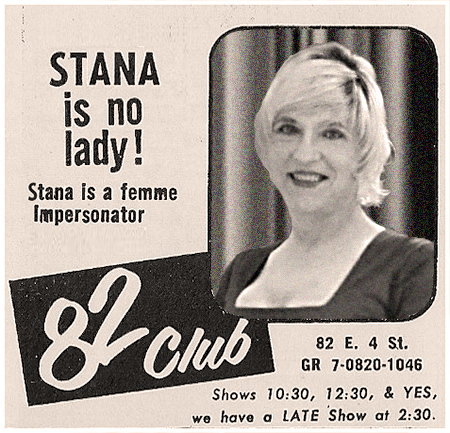 The ad always consisted of a photo of a gorgeous showgirl and was captioned "Who's No Lady?" The gorgeous showgirl was no lady, but a female impersonator and the ad was for the Club 82 in New York City, a nightclub that featured female impersonators. I was amazed that males could look like the showgirls featured in those ads. I was so fascinated with the transformation that I began cutting out the ads from the newspaper and collecting them with a paperclip. I agree that the more males dressed as females get out into the civilian world, whether they are TS, TV or anywhere else on the spectrum the better it will be for others. I think that the more civilians that have encounters with T folk the better it will be for the next one. Let us hope it snowballs. I also agree that for many of us our dressing started with one simple item and then grew over time. While I never found a way to dress as a girl for Halloween I vividly remember one year when I was trick or treating as Dracula there was a boy dressed as a girl. I remember he had a wig and a 'Donna Reed/June Cleaver' style dress with makeup, stockings and white high heels. I was very jealous. I could not have cared less that it may not have been proper to wear white pumps after Labor Day. I never had the courage to even consider asking if I could go as a woman. I would not have wanted my secret thoughts to be that close to the surface. I too got started with hosiery. I remember when I was 12 in 1978, my mother had turned 40 recently and had resolved to dress better. Out went the black polyester pants and in came a wardrobe of lovely skirts and blouses worn with heels and pantyhose. One day it hit me like a ton of bricks. I HAD to know how it felt to wear that skirt with pantyhose underneath. My mom had left her clothes in a pile in the bathroom. Next thing I knew they were on my body. It felt so delightful. To this day I love the smooth stretchy support of a good pair of control top pantyhose, I love the feeling of a lined skirt gliding over them and I love how the matte finish on my legs elevates the grace and elegance of every skirt and dress.